A Honolulu police officer escorted an elderly man across the crosswalk at 400 N. King St., where a pedestrian was killed Monday in an accident with the van behind them. The AARP is pushing the Legislature to fund a study of state and county intersections for crosswalk improvements. State and city officials are looking at a three-pronged approach to curb what's quickly become a deadly year for pedestrian fatalities. Education, enforcement and improvements to intersections are among the suggestions to reduce deaths, especially among elderly pedestrians. On the education front, the state Department of Transportation is starting a $100,000 media campaign tomorrow aimed at protecting school children. The Safe Routes to School campaign will involve television and radio public service announcements. "This is not a reaction to what has happened this past few weeks," Ishikawa said. "But I guess now it can't be any more timely." The state is also continuing its Walk Wise Kupuna program, which involves educational outreach to senior citizens. 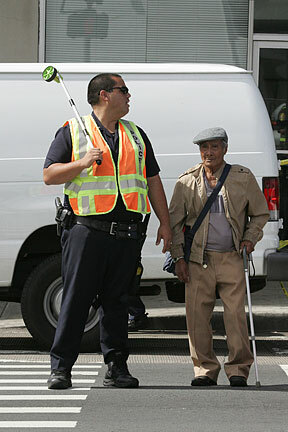 Five of the six traffic fatalities this year have been elderly pedestrians. Hawaii has the highest pedestrian death rate among the elderly nationwide, according to AARP Hawaii. 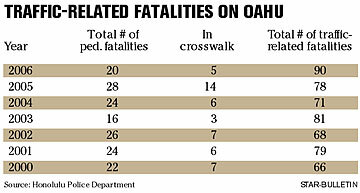 On Oahu, 669 accidents involving pedestrians of all ages were reported last year, including 20 fatalities. There were 757 accidents and 28 fatalities reported in 2005, and 722 pedestrian accidents and 24 fatalities in 2004, according to the Honolulu Police Department. Lt. Darren Izumo of the Honolulu Police Department's vehicular homicide section said some accidents may be unavoidable. Two of this year's pedestrian accidents happened to people on sidewalks. "That, to me, is not in anyone's control," Izumo said. "There's also no one area that's more dangerous than the other. Let's face it: It's a collection of circumstances, whether it be visibility or age." Izumo said the bottom line is both drivers and pedestrians have to be aware of each other, whether the light says walk or turns green. "No matter what, a crosswalk is not some magic shield," Izumo said. "You just always have to be on your guard." But AARP Associate State Director Bruce Bottorff* said it's important to identify dangerous intersections so they can be made safer. AARP is pushing the Legislature to fund a study of state and county intersections for crosswalk improvements, beginning with several the AARP identified last year, including Keeaumoku Street at Kapiolani Boulevard, and Ala Moana at Hobron Lane. The AARP audit found that several crosswalk signals changed too fast for many senior citizens to cross. The city Department of Transportation Services is already planning to ask for about $200,000 to retrofit crosswalk signals with countdown indicators. Deputy Director Richard Torres said the department has yet to determine where and how many signals will be worked on. "We're definitely looking at all the intersections that have had incidents," Torres said. State lawmakers are also looking at stepping up enforcement, including allowing cameras to catch red-light runners. Meanwhile the governor is proposing increasing penalties, including jail time, for people who do not stop for pedestrians. This is not the first time the state has tried to reduce pedestrian deaths on Oahu. In 2003, the transportation department installed rumble strips along Pali Highway after the death of a 90-year-old woman who was hit while crossing the highway near Niolopa Place in 1999, part of a string of pedestrian fatalities in the area. But the state had to remove the strips after complaints of noise, vehicle damage and backed-up traffic. The frustration in finding a solution may stem from trying to please everybody, said Paula Kurashige, vice chairwoman of the Nuuanu/Punchbowl Neighborhood Board. "A lot of people are trying a lot of things," Kurashige said. "But with all the cars we have, and trying to keep the flow that we have in traffic, and keeping people safe ... where else can we go with this?" Something has to be done, Bottorff* said. "We're an urban area, a car-oriented society and often times we find communities that haven't been planned in ways that are conducive to mobility and older people maintaining their independence," Bottorff* said. The recent news of pedestrian deaths has rattled 75-year-old Adelaida Juanatas' nerves, but the Kalihi Valley resident continues to walk to her bus stop, even if it means jaywalking occasionally. Robert and Ritamarie Stone, 72 and 68 years old, used to live in Manhattan, "where these kind of things don't even make the news." The couple watches out for each other while crossing the street. "The drivers here seem too careful," Ritamarie said. "Cars will stop and tell me to cross even if I don't want to cross. That's why we moved here, but sometimes it's annoying." "Most of the old people, they should stop and look when they cross the street, but sometimes they don't," Robert said. "But if I do something wrong, she beats me when we get home." » Increased penalties for drivers who fail to yield to pedestrians in a crosswalk. Gov. Linda Lingle wants to impose a $150 fine, with a 90-day license revocation. The second offense would bring a $300 fine and a 180-day revocation, and a third offense a $1,000 fine, one-year revocation and 30 days in jail. Current penalties do not have provisions for license revocation or imprisonment. » Red-light cameras. House Transportation Chairman Joseph Souki would like to install cameras at intersections to catch motorists running red lights. » Money for studies. The state kupuna caucus at the Legislature would provide funding for the state Department of Transportation. The money would be used to identify problem intersections. » Education. The state Department of Transportation begins a Safe Routes to School outreach program tomorrow with TV and radio spots. The program is an extension of the department's Walk Wise Hawaii project. >> Better crossing signals. The city Department of Transportation Services is asking for about $200,000 next year to begin installing countdown indicators at several crosswalk signals in the city. » Bruce Bottorff is associate state director for AARP Hawaii. His last name was misspelled as Borttoff and Bortoff in a story on Page A1 Sunday.